I visited my daughter's Brownie troop this past December to teach the girls how to make fresh-cut evergreen swags. The craft went quickly; before long it was time to wrap up and I was invited to join the "closing circle." We stood with our hands held together, right-over left, and it came back to me in a flash - the way we closed Brownies and then Girls Scouts when I was a child with the same circle, the same gentle hand squeeze that passed from person to person. With your hands crossed that way you can turn and spin your way out of the circle, everyone slowly unwrapping like a pretzel while still staying connected. If anyone told me three years ago that I would find significant community online, I would likely have given them the same doubtful looks, the same disbelieving questions that I get from others these days. You can't really get to know people online, can you? And yet, here I am, with a significant amount of my most meaningful support, encouragement and comradery coming from online relationships. There's the former Pastor, now writer and Spiritual Director in California who pops in from time to time, always with a word of encouragement. And the new friend in Washington State who sent me a book in the mail because she "really thought it would speak to where I'm at." There are the men who graciously allowed me to walk through Advent with them, and the other author who trucked his whole family out to our house to do a small book reading. Online, I have the privilege of finding others whose voices and way of being in the world echo my own and that, for me, is a rare and real gift. It's hard sometimes for people to understand how isolating having twins can be - how difficult it is to get to and enjoy even the simplest social gatherings. While we still need (and are grateful for) the real flesh-and-blood neighbors who fill-in with a warm meal or a walk in the park at the end of a long, frustrating day, I find myself immensely grateful for the wide world of connection that waits here at my finger-tips. Beth Hess, in her own words, is a "Beauty Hunter, God Spotter, Grace Giver, Story Teller, Key Dropper." She blogs regularly at her newly redesigned blog space Trading Good for Grace. Amber Cadenas writes "with the hope that others might be inspired to see their own lives through different eyes." Her blogging home is called, Beautiful Rubbish: everyday art of learning to see. Jody Collins is a substitute teacher by day and writer by heart who describes herself as "looking for Jesus in the everyday light, singing and writing along the way." She blogs at Three Way Light. I would love it if you could make a habit of visiting and encouraging these wise and gifted women. Here we are - Jody, Amber, Beth and I, linking hands, left over right in a circle together. Won't you join us as we stand and sing, twist and turn, unfolding together in friendship? Oh, Kelly, this made me smile and tear up a bit....yes! these friendships are real and life-giving. And some day--some day! I'll get to tell you in person. So glad to be an encouraging voice is this little Small Wonder community. Kelly, I have continued to be amazed at the connections & relationships God brings into my life. I find myself grateful to be here with you all each Monday. May God continue to bless & grow this community! Thanks, Robert. I've got to get looking into that - several surprises on the home front last week kept me busy and distracted. "If anyone told me three years ago that I would find significant community online, I would likely have given them the same doubtful looks, the same disbelieving questions that I get from others these days." For me, I think this has been the most amazing surprise to blossom from blogging...finding myself a part of a vital meaningful community of people who have, for the most part, never seen each other's faces. Thank you, Kelly, for hosting this link-up! "the most amazing surprise to blossom from blogging." That's what it is, isn't it? Like a rose bush you find happily hiding behind a shrub. I'm so glad you can relate. I think it's so interesting how a deeper connection to self (via writing) can be so deeply related to a deeper connection to others and also, to God. 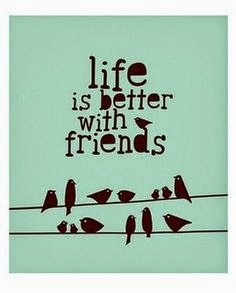 I would never have believed it about online friends either, but I know now that these friendships can be just as true as in-person ones. Thanks for keeping this community together, Kelly, and now thanks also to Jody, Amber, and Beth! So Much Amen! I love this truth... for so long 'online connections' have been thought of as superficial or surface --impersonal even. But that has never been the case for me! I am blessed by online communities all over the web and some of those friendships get deeper, faster, and are just as (if not more) real than my face to face friends! I believe we need both... benefit from both... and am thankful for both! Yes, Karrilee, both is so very often a good answer! Thanks for hosting. I too have blessed by online friendships like the other comments. Oh friend. How I hear you, yes, resoundingly clear. My story echoes these words of yours, too, different in their own way, with similar threads. I've been reflecting with a profound sense of gratitude lately, how most of my deepest friendships at this point in my life are here. Right here. Online. I never would have believed that several years ago. I love it when I'm wrong about these things. How beautiful that you've found a supportive, encouraging community where you didn't expect - and with the isolation of having twins, how much more beautiful that it's always here, at the tips of your fingers. I'm grateful we're a part of each other's communities, Kelly. Praise God for the online community encouraging one another! I believe the Bible speaks prophetically of the Internet (running to and fro, and knowledge shall increase). Thanks for the great post & for hosting!